Has anyone really cheered for Cheerios? What’s so special about K? What is Total adding up to? Who would turn Trix in their stomach? Never listen to Snap, Crackle, and Pop. Does sugar really need to puff? Such a creative and fun post, thank you! 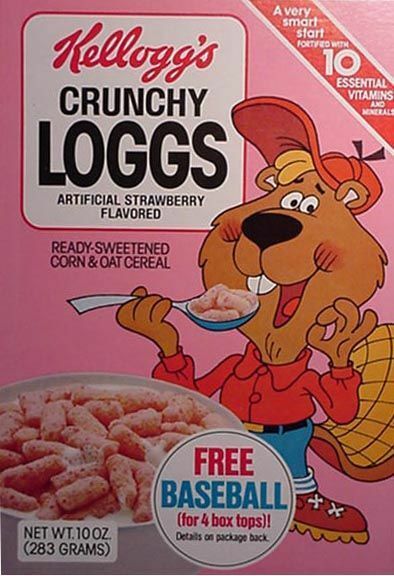 As a child, I was only permitted a sugary cereal once or twice a year. My favourite cereal was Shredded Wheat with boiling water poured on top and drained, then sprinkled with sugar and drowned in milk. Now I’m a vegan; I prefer organic, grain-cereal with fresh fruit and soy milk. I did like this poem; it was a nostalgic journey. Captain Crunch was my favourite, by the way. There is something different about K! The entire lot is pure “Poison”. Those companies are killing people and they fool us with their marketing programs. Anyway, The Illegitimate Rice Crispy, “Snap, crackle and no pop”. A great read, by the way. Such truths in a fun way! so true, you should NEVER eat a berry if it’s crunchy! great poem! Hehe i love this, the opening line is even funnier if you know who captin crunch of the phone phreakers is! Clever and funny. But how could you forget Kashi? I’ve never heard of Kashi. Have I missed something? Trust me–you’re not missing anything. 😉 Nice post, btw (although that photograph of the conehead clown is likely to give me nightmares). Reblogged this on The window lets in air, light and dust. Cheerios. Rah! Rah! Enjoying the basics. Ha Ha Genius 🙂 I was only playing with the serial cereal the other day! In England after the war we had only puffed wheat, cornflakes and Weetabix as I remember. There are so many more now but not as many as in the USA. The big growth seems to be in Free From and “Healthy” brands. Since I was a child, photos of clowns have always left me feeling unsettled, and many years later, they still do. But, I’m glad that I stuck with your poem (in spite the clown image at the start), and read it to completition. Clever and funny — it was a delightful read. 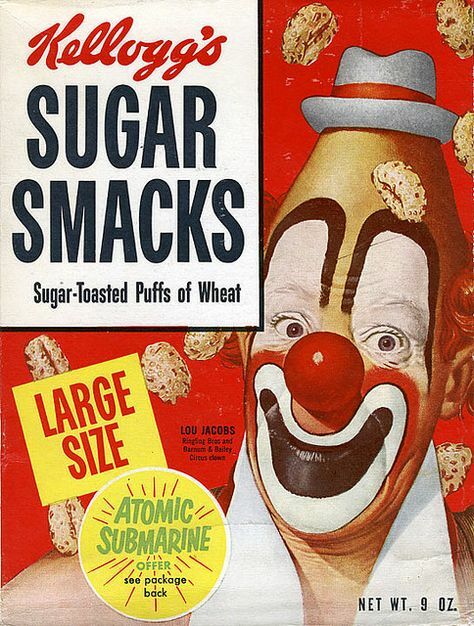 Clowns and cereal, go figure. Kashi is started as a cereal in the U.S. made from whole grains – read “healthy”. It branched out to snack bars. I keep one in my purse for hunger emergencies. Thank you for liking “Seeking the Divine.” I enjoyed your sense of humor in this poem, but I also like its serious message. I think I ate nearly every cereal you mentioned in this poem when I was a child. I was brainwashed into eating them by all the fun and colorful cereal commercials I saw on TV. I did not realize just how bad all that sugary processed food is until I got older. Over the years, I have learned that some corporations don’t care if they sell low-quality, unhealthy, and in some cases unsafe products to people as long as they make a profit. I’m loving this one. Similar to one reader, my mother rarely allowed me to eat the sugary kids cereals, and for that, I thank her. Even the “healthier” sounding ones like Raisin Bran are misleading as you pointed out. There needs to be a cereal killer so we can wipe out these baddies. lol! I like that silent clapping. This is a new venture, so it’s very generous of you for being supportive. As a cereal lover, Honey Bunches of Woes made me smile!